Pantech has produced quite a few Android smartphones in recent months and they usually try to offer something a little different. The aptly named Pocket is a square-ish device running Android 2.3 Gingerbread. The extra wide screen provides plenty of real estate for easy one handed operation, but it’s not a look that everyone will love. In terms of features and pricing this is a mid-range device. The Pantech Pocket looks odd. There’s no getting round it. It is a candy bar smartphone with an almost square shape and rounded edges. It measures 4.52 x 3.07 x 0.44 inches (114.7 x 78 x 11.3 mm) and it weighs 4.66 oz (132 g). The display is 4 inches with a 600 x 800 pixel resolution. The screen is intended to improve the multimedia experience and web browsing on the phone and it does achieve that to a certain extent. It also makes typing on the virtual keyboard easier. There’s a textured surface on the edges and back so it is easy to grip. It actually looks a bit like it has a case on. You’ll find the standard four Android shortcuts beneath the screen for Home, Menu, Back and Search. Up top there’s the power/lock button and the 3.5 mm headphone jack. You’ll find the micro USB port on the right (in the middle which is weird) and the volume rocker on the left. It is made of plastic, but the build quality is quite good and it feels like a solid device. The phone is running Android 2.3 Gingerbread and it does have a Pantech UI over the top. The Pantech overlay is quite good and it should be ideal for newcomers to Android. They provide a lot of different widgets to allow you to customize your home screens with the info you want. The aesthetic is not as stylish as something like HTC’s Sense, but is accessible and easy to use. The shortcut dock at the bottom of the screen offers shortcuts to calls, messaging, Internet and the app drawer. Apps scroll left and right instead of up and down. Most of the tweaks are similarly simple. The nicest one is the ability to directly launch various features from the lock screen by dragging them into the middle. 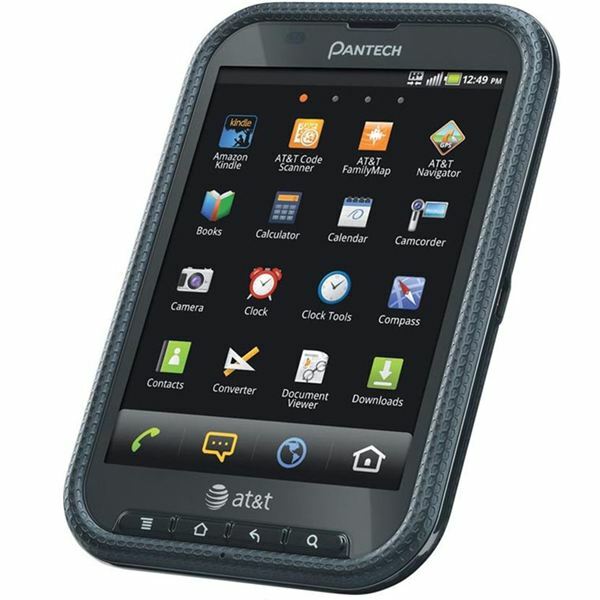 The Pantech Pocket supports AT&T’s HSDPA+ network which they call 4G but obviously it isn’t anywhere near as fast for data downloads as LTE. It also offers support for Wi-Fi, Bluetooth 2.1 and GPS. You’ve got 600 MB of built-in storage and it comes with a 2 GB microSD card, you can expand it by up to 32 GB thanks to the microSD card slot. Multimedia support is good for audio and video although you might notice some stutter during video playback which isn’t so great. Support for email, messaging and web browsing is a typically solid Android experience. It does support Flash and pinch to zoom is fairly smooth – it’s not perfect, but for a 1 GHz phone it is perfectly usable. The camera is a 5 megapixel affair and it can also record 720p video. There’s no front facing camera. The photo quality is reasonable, colors are a bit faded, but it’s not too bad. Video quality is also quite good. 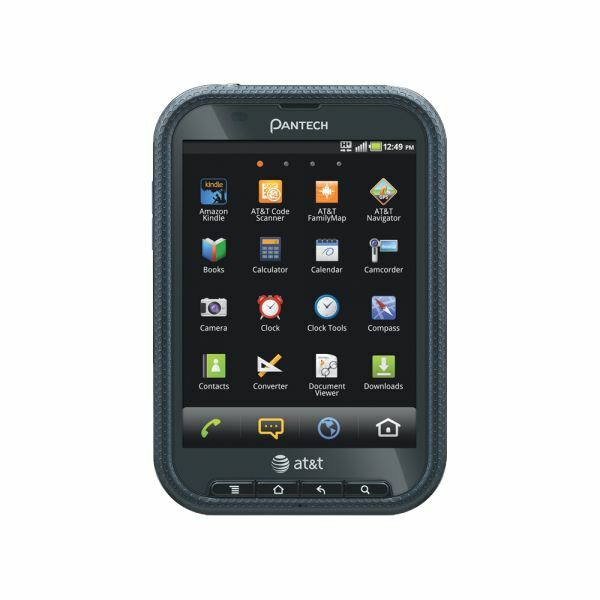 You’ll find the usual Google apps and also some bloatware courtesy of AT&T and Pantech. Luckily you can uninstall most of the AT&T apps. You shouldn’t have problems with call quality and the volume is good and loud. The Pantech Pocket has a single core 1 GHz processor and 512 MB of RAM. Performance is decent, but there is a little bit of lag from time to time and it’s not the fastest or smoothest operator on the market. The battery is rated at 1650 mAh and you should get around 6 hours of talk time out of it. As always it depends on how you use your phone, but this is a decent sized battery and you should get a couple of days between charges on moderate use. The Pantech Pocket definitely stands out thanks to that design and the 4:3 aspect ratio on the screen is not a bad idea. You’ll either love it or hate it. It is a mid-range phone so while build quality is decent the hardware on offer here is not top quality. For $50 on a two year contract this is a decent option and should serve as a great introduction for anyone brand new to the Android platform.